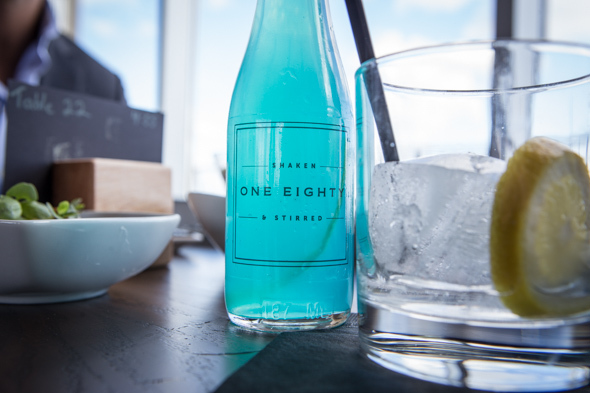 The One Eighty replaces what was once Panorama Lounge, a 51st floor restaurant in the Manulife Centre with sweeping views of the city. A five-week reno has entirely transformed the space - the ceilings have been raised, and the room has been reworked with dramatic black finishes, white marble and brass accents. The open dining room and emblemized bar greets guests as they exit the elevator while semi private dining alcoves and a lounge branch off from the main room. The bar is well stocked with beer, wine and signature 2oz cocktails served in branded bottles that are poured over ice at the table. The Citronade ($15) is one example, a tart, refreshing and not too sweet blend of limoncello, vodka citron, blue curacao and lemonade. Aside from drinks and the view, the bar cart service is an enticing attraction. 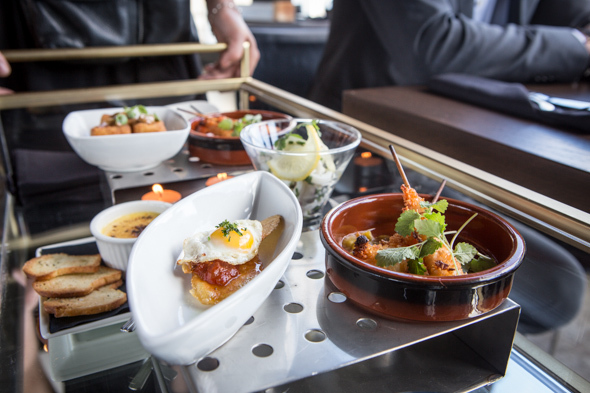 It's rolled over at request, or pops by between courses offering an ever changing selection of hot and cold delights like brussel sprout caesar salad, foie gras creme brulee, and shrimp brochettes each priced between $5 and $10. Each table is outfitted with a little card that receives gold stamps representing each selection to be tallied on the bill. I could make a meal of these little impulse purchases alone. The opening menu offers a roster of approachable dishes. 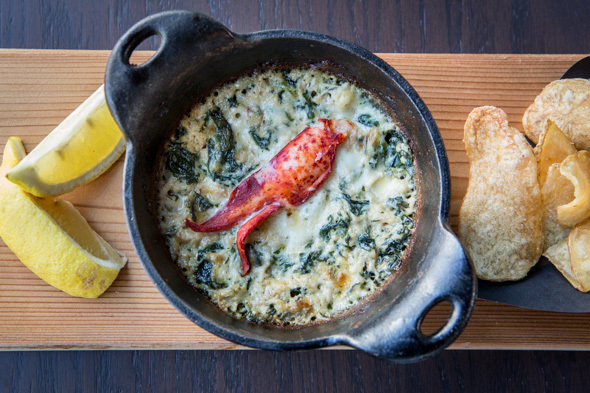 Starters like the crab and lobster dip ($18) aren't much more substantial. The cast iron pan is so shallow you'll have to ration it out cautiously on the supply of house-made kettle chips. 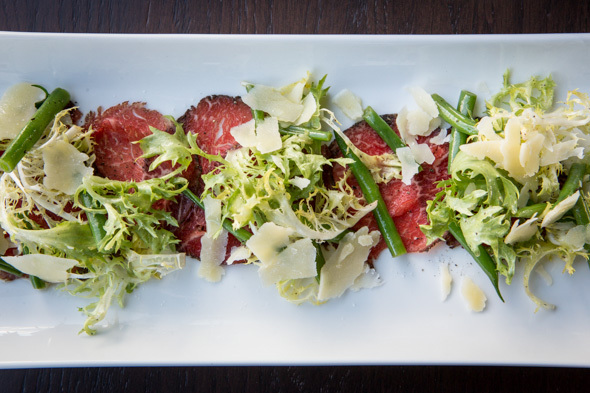 The peppery beef carpaccio ($16) will leave you wanting more too. It's lovely nonetheless, paired with fresh green beans, frisĂŠe and shaved pecorino. 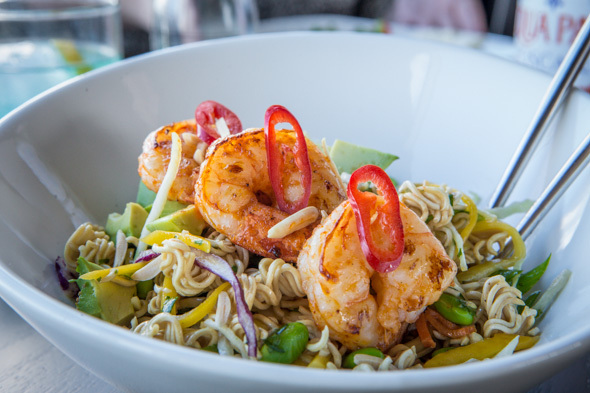 Crunchy ramen salad ($22) is a vibrant dish composed of avocado, mango, edamame and dehydrated noodles of the packaged variety. Let me first say that I love this dish, but I'm surprised to see it here. I have a similar slaw in my own home-cooking repertoire and I whip it out at potluck BBQs because I can make a bucket of it for cheap. Not even the trio of supremely delicious sriracha shrimp on top could make me feel that this merits the price. 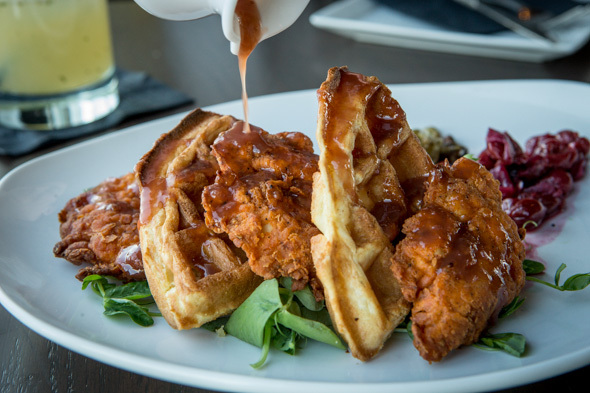 Same with the buttermilk fried chicken and waffles ($27); it's well executed and there's lots of tasty components, but the price is exorbitant. 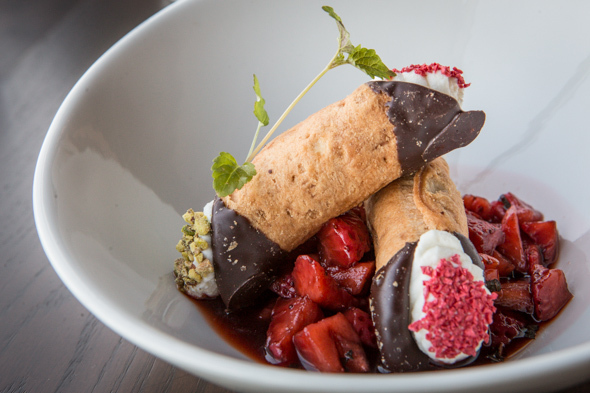 I really like the strawberry cheesecake cannoli ($11) rolled in freeze dried strawberries and crushed pistachio then served atop balsamic macerated strawberries. This and the view at sunset would make me happy without breaking the bank. 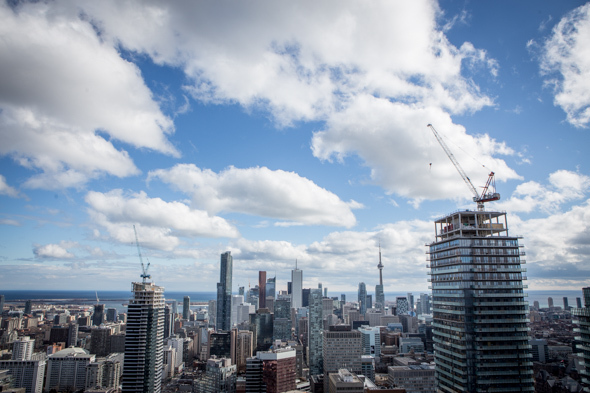 The One Eighty has a lot of things going for it; great atmosphere, awesome view, and fun bar cart service, but I thought the food was prohibitively expensive even for its Yorkville address and the obvious allure for tourists.